Most of us have used a phrase from the past that has stuck with us years later. The phrase, “You can pay me now or pay me later” is one many of us remember and use. It’s from the FRAM oil filter commercials in the 70s and 80s. 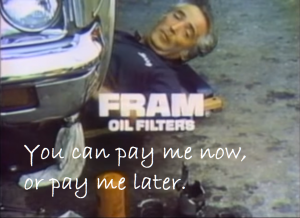 The implied meaning of the phrase in the commercial is basically you can pay some money now for a good oil filter or, if you don’t, you’ll pay much more later when your car breaks down. This phrase has relevance across many goods and services. For instance, most of us don’t relish going to the dentist for a regular cleaning and check-up, let alone having to pay for it! But, if you didn’t have this service and ended up with a serious dental issue that required an implant, bridge, or worse, you would have to pay a much larger out-of-pocket expense later on. It is also extremely relevant to consumer credit. We all have a credit report and score on file with the three major credit bureaus. Your credit report directly determines what kind of interest rate and credit terms a lender is willing to offer you. That’s your payment! The better your credit score and information on your credit report is, the better the terms most likely will be for your next personal loan. One sure way to improve your credit report and, more than likely, improve the terms on your next personal loan is to pay a professional to have inaccurate and unfair negative items removed from your report. A firm like Lexington Law has helped hundreds of thousands of customers with their credit report. Most people don’t know what an inaccurate item might be on their report and that by removing it and others can really help improve their score. In 2017, Lexington Law helped remove 10 million items from credit reports. By paying now to have your credit report “polished” could help you later when it’s time to get that loan you want or need and do so with much better terms. So, you can pay Lexington Law some now, or pay the lender more later!